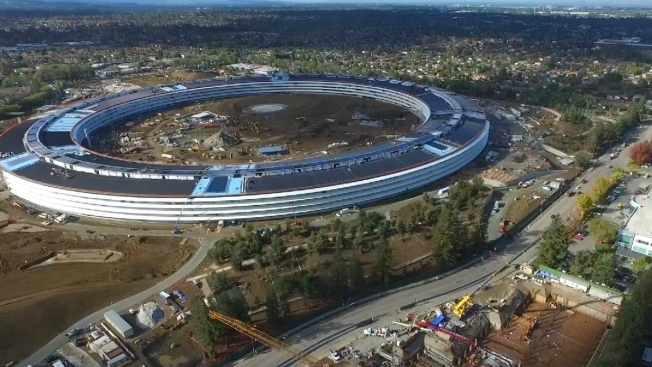 A new drone video released over the Thanksgiving weekend shows that Apple's new "Spaceship" building in Cupertino is nearly completed. David Sexton, who runs Sexton Videography, made a trip from his hometown Chicago to California's Silicon Valley over the holidays. He sent his DJI Phantom 3 Advanced drone into the air over Apple's new campus. "I'm an Apple fan boy," Sexton told NBC Bay Area by phone on Monday. "I was on vacation and no one was around, so I decided to do a flyover." Sexton did the same thing last December, and noted how remarkable the construction changes were in a year's time. "It was just a shell," he said. "It's really blossomed." His video, taken on Thanksgiving and posted on Nov. 25, shows aerials of Apple's 176-acre Campus 2, aka the Spaceship, being built between Homestead Road and Interstate Highway 280. The solar-paneled, space-age, circular building is slated to open in a few months, in early 2017. The drone video also shows an underground auditorium, a huge research and development building, a tunnel with underground parking and a fitness center for employees. A representative from Apple's Campus 2 media list did not respond for comment.